The main reason for using a pressure sensor with CANopen interface compared to customary analogue sensors is the low degree of wiring required and the high reliability of signal transmission. The data and power cables of the CAN bus are combined in a single shielded CAN cable and passed on from one bus user to the next, i.e., the bus is really a “chain” of CAN bus users. As a result, each bus user must be provided with two electrical connectors- an input and an output. For sensors in the industrial environment, the connector most widely used for this purpose is the M12x1 connector. The electrical connection of the device is made either via an external T-piece (see picture on the right) or via Y-connectors directly integrated into the sensor (see picture on the left). A Y-connector that is completely integrated into the device has the great advantage of being much more robust (EMC effects, resistance to shock and vibrations) and clearly more compact (overall length). 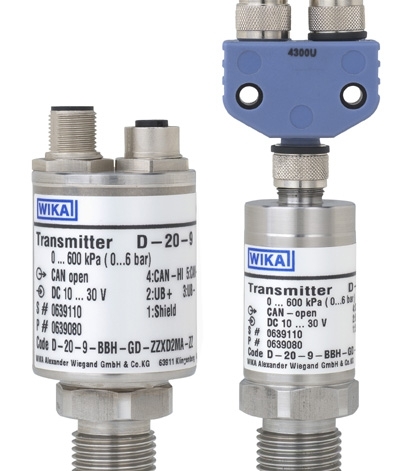 Just compare for yourself the two available designs of the WIKA D-20-9 pressure sensor: Comparison of integrated Y-connector and external T-piece: the Y-connector is clearly more compact and more robust Recommendations where, how and why the CAN bus is used, can be found in the technical article “CANopen pressure sensors in test benches and mobile hydraulics”. For further details on the CANopen standard, please refer to the homepage of CAN in Automation User Organisation.